Learning a language is a task which never completely ends. Whether you’re a fresh-faced newbie or a grizzled veteran, there is always new vocabulary to learn and grammatical structures to refine. 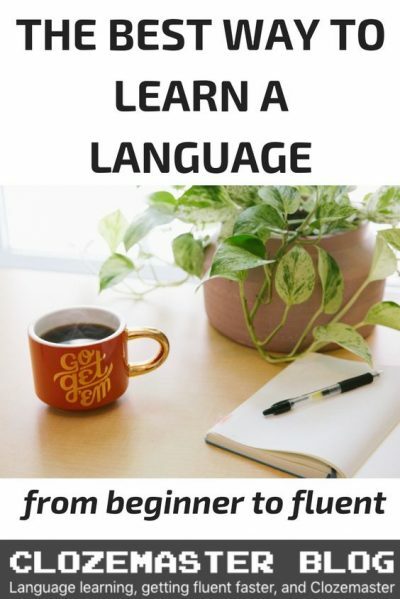 The article examines the best way to learn a language, how best to focus your learning at the various stages of your linguistic development and how to continue making progress. The Common European Framework of Reference for Languages divides language proficiency into three levels. These are basic user, intermediate user and proficient user. Language competence is commonly separated into four core skills – reading, writing, listening and speaking. Each stage of proficiency entails a different level of competency in these four skills. This article will focus on each of these categories in turn and examine the best way to learn a language at each stage. You are taking your first tentative steps into the world of your chosen language. It’s an exciting time. The world is alive with possibility. You begin to imagine your new life once you have acquired the new language. Perhaps you’ll move to France and start your own vineyard? Maybe you’ll become a translator at the European Union? However, this enthusiasm can very quickly disappear if you do not put a plan in place. A few unproductive lessons in a row might make you decide to drop the enterprise altogether, as you realize the enormity of the task you’ve set yourself. At this stage, it is important to establish a study routine and stick with it as much as possible. Beginners often do not realize how little they know. It is only as they begin to make progress that they begin to understand the complexities of language as a whole. It might take months to observe any discernible progress. You should embark upon the learning of a new language with realistic goals. Learning a language is difficult and it will take time to see meaningful progress. You should not allow early setbacks to discourage you. The Common European framework recognizes two stages at the basic user level. These are breakthrough and elementary. The breakthrough is the very initial stages of learning a language. A learner has mastered the breakthrough level when they can introduce themselves and use very basic everyday constructions. They can describe themselves and they can ask and answer basic questions. At this stage, a learner can only interact with other users in a very simple way and is reliant on a lot of help form the other party. An elementary learner has proceeded beyond this very basic level of development. They understand sentences and frequently used expressions and are able to communicate simply with regard to routine matters. At this stage of your learning, it will be useful to (1) buy a book which is aimed at beginners in the language, which will help guide you. Do some research and find out which is most highly regarded. It would also be helpful if you could (2) enroll in a class. This would give you the opportunity to interact will be other like-minded students and the guidance and feedback of a tutor would be invaluable at this stage. It would also give your study some much-needed structure. If a class is not an option, it is useful to sign up to a (3) language-learning app. Duolingo is aimed at beginners in the language. It introduces the learner to the basic vocabulary and its exercises are designed to fix the new information in your mind, ready for use. The Clozemaster app has functions where the language used is restricted to the most commonly found items in the language. This can be useful at the early stages. As a beginner, your focus will be on learning practical, everyday phrases. Focus on learning the necessary vocabulary and on using it in full sentences. You should not spend too much time trying to master grammar at this stage. You should focus on conveying basic meanings in full, correct sentences. This stage of development will be characterized by a lot of rote learning. At the end of each lesson, make a note of the vocabulary you have encountered. Spend some time trying to commit the vocabulary to memory. Test yourself. Make sure you have acquired the information before moving on to another topic. When deciding to learn a language, it is useful to think about your intentions. For learners who intend only to use the language informally, reading and writing may not be very important. However, those who wish to use the language in formal environments will need to become proficient in all four competencies. I would argue that it is worthwhile to focus on all four competencies, even at the earliest stages. It might not be clear about how your linguistic journey will progress, but a grounding in all four competencies will be useful as you proceed to the subsequent levels. This is the best way to learn a language at this stage. Reading and writing might seem easier in the earliest stages of language learning. When engaged in reading and writing, we have the luxury of time. We can double check the vocabulary in a dictionary and we can reflect and amend a sentence if necessary. In contrast, the skills of speaking and listening require a much quicker processing time. These are skills which take time to master. Clozemaster and Duolingo can be used by beginners to get to grips with the sound system of a language. These apps play recordings of the phrases and vocabulary in the exercises. Exposure to the sounds of a language as you learn how read and write it is enormously helpful at the beginner stages. Most textbooks come with audio files these days, which can be used in conjunction with the exercises. This is perhaps a less convenient option, but it serves the same purpose. Learners at this stage should aim to reproduce the new sounds they encounter. You should try to get into the habit of reproducing every new sound you hear. At the end of every lesson, you could read the list of new items you’ve learned aloud. It might be useful to record yourself and compare your production to that heard on the audio you have been using. This will help you to monitor your progress. You could perhaps read them to a friend who can speak the language and ask for their feedback. Focus on the sounds which are different from those in your native language and try to replicate them faithfully. Repeat them and make any necessary corrections. At the intermediate level, you are beginning to use the language productively. You are no longer learning holistic phrases by rote. By the intermediate stage, you have learned the basic rules of grammar. When you encounter new vocabulary, you can use it productively, applying the rules you have established. At the basic level, the language you use focuses on the present tense and on issues of immediate relevance. At the intermediate level, on the other hand, you should be able to express more complex ideas about past experiences and future ambitions. As you make progress towards the more advanced intermediate level, you will have enough knowledge to interact with native speakers with fluency and spontaneity. It is at the intermediate level where users establish a solid understanding of the grammatical rules which apply to your target language. Many find grammatical concepts tricky, even in their own language. The average person on the street might struggle to explain the difference between the 1st person singular and 1st person plural, for example. Learners often find that they begin to understand the grammar of their native language better by studying the grammar of their target language. With this level of maturity in your learning, you are able to experience the language as an interconnected element of culture, rather than simply as a system of communication. When you have attained this level of competence, there are many more learning opportunities open to you. Clozemaster is a very useful tool for learners at the intermediate stage. The app is designed to expose the user to new vocabulary is familiar contexts. This is helpful for learners who have a good knowledge of the basics. The app monitors your progress. It recognizes when you begin to demonstrate mastery in a particular item of vocabulary, and it tests you on these items less frequently. Additionally it offers grammar exercises focusing on difficult grammatical topics for a number of languages. At the intermediate stage, you will be exhibiting more fluency in all four of the core skills. You will have more confidence in your abilities and you will be happy to expose yourself to new challenges. The best way to learn a language at this stage is through applying what you have learned to new contexts. Reading at an intermediate stage becomes less of an ordeal. You can seek out reading materials that interest you, rather than those which are imposed on you by a language course. Take advantage of the opportunity! You should now, for example, be able to read shorter newspaper articles with the aid of a dictionary. Perhaps you could seek out websites or blogs which focus on your interests, and aim to acquire the relevant vocabulary. Readlang is an excellent resource, as is the cloze-reading feature on Clozemaster. You should also be able to follow the language in comic books or in novels aimed at children or teenagers. When reading, note down the new vocabulary items and try to absorb them. Once the basic grammar of a language is acquired, the major work of language learning is acquiring new vocabulary. This never ends, no matter what level of competence you attain. Good learning habits will stand you in good stead into the future. You will now be able to write more fluently – aim to develop these skills. When writing, you can make use transition phrases. Once you learn how to say phrases like ‘so that’ and ‘in order to’ in your target language, you will find that you are able to express your opinions much more fluently. It is useful at this stage to write as much as possible. There are several websites which allow you to connect with pen pals in the language of your choice. Interpals and My Language Exchange are websites which offer this resource. These sites let you connect with new friends in the target language via e-mail or snail mail. Regular writing practice will greatly improve your skills. Speaking and listening can still remain a challenge at the intermediate stage. At the basic level, learners practice speaking and listening primarily in order to come to terms with the sound system of language. At the intermediate level, learners begin to use these skills in order to interact with others. Speaking and listening at the intermediate level are social skills. It takes time to recognize social cues which are prevalent within a language speaking community. Finding regular opportunities to have an interaction in your target language can be difficult. It is probably unlikely that you will have a friend who speaks the language with whom you can arrange regular conversations. However, there is a range of language learning communities online where you will be able to find a conversation partner. HelloTalk and Speaky are all sites where you can find a like-minded language partner for regular Skype interactions. At the intermediate stage, the flow of the conversation is likely to be disjointed, and there will many false starts. Do not let this discourage you! You will soon begin to see progress if you persevere. Your language partner is likely to be a fellow language learner and will understand your difficulties. The vastness of the internet provides ample listening opportunities for the language learner. Try to find listening materials which deal with topics that interest you. You might like to begin with content which has been produced with language learners in mind. There is an enormous number of podcasts and YouTube channels which focus on learners at different stages of their linguistic journey. These are often structured like lessons and aim to teach a specific piece of pronunciation or vocabulary. Listening to content which has been produced for native speakers can be difficult at this stage. Divide your listening practice into active and passive listening. Focus intently on a one minute burst of dialogue, for example, and try to transcribe it and decipher the meaning. Combine this focused study with longer periods of passive listening. Perhaps you could listen to a new broadcast or an audio book while you are doing chores. You will perhaps only understand 15-20% of what you hear at the intermediate stage, but you will pick up new words and phrases here and there. You will gradually understand more with regular practice. Listening practice, even if it is passive, will inform your speaking. You will gain understanding of the rhythms of the language and you will learn about social cues in interaction. These are skills which which are difficult to learn from books. Advanced users of a language can make flexible use of the language in a range of contexts. They can use the language in social, academic and professional domains. They express ideas fluently and spontaneously and do not have to spend time searching for expressions. Advanced users write cogently in the target language and understand finer shades of meaning. This is the stage where a learner becomes a linguist. Up until now, you have been measuring your progress in leaps and bounds. Any advance you make at the beginner or intermediate level is major addition to the sum total of your linguistic knowledge. By the advanced stage, you will already have acquired most (if not all) of the major features of the language. From now on, your linguistic development will take the form of marginal gains. You have begun to engage with the culture of which the language is part. You might have taken a closer interest in the politics and the news of that culture. At the linguistic level, you may now consider taking an interest in variation within your target language. It may be spoken differently in different cities or in different parts of the world. Take the opportunity to expand your knowledge. You may be able to find radio stations in all varieties of your chosen language. An English learner might like to study how the language is spoken in different parts of the USA, for example. You might like to learn about the differences between the ways in which older and younger people speak. There is a multitude of ways in which language can vary. Examining this variation can allow the advanced user to maintain their interest for years to come. Expose yourself to new linguistic contexts. If you have always wanted to take a closer interest in jazz, for example, consider using your target language as the vehicle for this interest. Join an online forum and connect with new speakers. This way, you will engage with new topics and expand the contexts in which you can fluently use the language. The study of the four competencies at this stage is about maintaining your high level of attainment. This can be a dangerous stage for a learner. You may feel that you have acquired all the knowledge you need and you may make less effort to improve. It is easy to remain within your comfort zone, focusing on your strengths, but you should aim to continue your development. Language skills weaken through neglect, so it is important, even at this elevated level, to maintain an active regime of study. The best way to learn a language at this stage is through continuing to set goals. Focus on your weaknesses, and aim to eradicate them from your game. An advanced learner should be able to read and understand almost everything they encounter in the target language. Learners can maintain this level of competence through frequent reading. At this level, you should aim to challenge yourself. Read more complex works. Why not pick up the classics of world literature in their original language? You could try working your way through out the books of Nobel prize-winning novelists who have written in your target language, for example. When writing, advanced users should similarly aim to challenge themselves. Maintain correspondences with native speakers and write regular e-mails or letters. Consider turning your hand to poetry or short fiction in the target language. Perhaps you could start a blog in the target language? At the advanced level, the entirety of the language is accessible to you. Make use of the resources at your disposal. Clozemaster is also very useful at this stage. You can make use of the more advanced settings in the app, which focus on the least commonly used vocabulary in the language. There is still much to learn, even at the advanced level. At an advanced stage, it is perhaps within speaking and listening that you will able to see the most marked improvements. Through regular interactions and regular exposure to the language, you will improve your knowledge of the social cues which exist in the language. Continue to listen to podcasts and aim to watch movies in the target language without subtitles. Take note of the new vocabulary you encounter. You might consider starting your own podcast in the target language. If you are planning to broadcast in your second language, this will motivate you to iron out any remaining flaws in your pronunciation or expression. At the advanced level, you have the privilege of unlimited access to your target language. You can engage at any level you wish. Make the most of every opportunity. This article provides a solid overview of the best way to learn a language at any given level of development. By following these tips, you can maintain your motivation and continue to find innovative ways to study, from beginner to fluent. Have a strategy or resource we should add? Let us know in the comments! Hi Theodore – thanks for your post. I agree – there should be more information out there about how to keep improving once you have attained a high level of competence. I think it is a stage where you can get lazy and stop making the necessary effort. We need to keep challenging ourselves! Great article, has a lot of valuable information. Thanks!